With an estimated population of approximately 30 million people, Venezuela is among the most populated countries in South America. It is bordered by other populous countries, like Brazil and Colombia, and its capital Caracas, a popular metropolis, is home to roughly 2 million inhabitants. 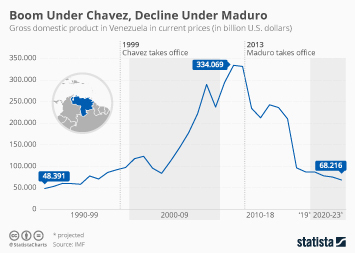 As a result of the implemented populist policies, a major economic crisis is rocking Venezuela right now and resulted in hyperinflation, food and water shortages, increased unemployment, and increased violence rates. Consequently, Venezuela scores extremely high on the misery index for the most miserable countries in the world. In 2017, Caracas was also one of the most dangerous cities in the world - only surpassed by Los Cabos, Mexico. Additionally, Venezuela ranked third among the 20 countries with most murders per 100.000 inhabitants. Venezuela's plight does not stop there - the Bolivarian Republic of Venezuela is among the most corrupt countries in the world, a view shared by the vast majority in the country: In a survey conducted from 2010 to 2013 on corruption in the country, 75 percent of the respondents said they believe that corruption is widespread throughout the government. Thus, a series of anti-government peaceful protests began, but over time, they became violent, resulting in numerous deaths. President Nicolás Maduro, who has been in power since 2014, is challenged by the federal deputy to the National Assembly, Juan Guaidó, who at the beginning of 2019 took an oath to serve as interim President after Maduro's claim to the seat had been contested. As a consequence of the political instability of the state, the economy suffers as well, as mentioned above: Gross domestic product has been fluctuating and is now on a downwards trend. The economic recession led to an incredible inflation rate of more than 1,000 percent in 2017. Thousands of people are leaving the country in search for better economic conditions and stability. The oil and gas industries are the most profitable industries of the country, Venezuela has the largest crude oil reserves worldwide, and produced more than 134 million metric tons of oil in 2016. The most important export and import partner of Venezuela is the United States, a relationship that is now straining under the current climate, and probably due to its oil exports, Venezuela has been able to maintain a trade surplus. More interesting topics from the industry "Venezuela"